Today I read a heartwarming account of how eight squatters became community librarians and reopened a north London library that had been closed by the local council. Eight squatters entered the north London library last week through an open window. Since a law change on 1 September made it a criminal offence to squat residential properties, they have turned to commercial properties to find a bed for the night. The occupation has the blessing of many residents who are delighted to see the locked doors of the library flung open once again. It's the first time that squatters have morphed into "community librarians" by occupying and reopening a public lending resource in this way. Book loans will be manually recorded and stamped. Council officials have been trying for months to persuade locals enraged by the library closure to become volunteer librarians in a room in a nearby council building instead. The proposal has not been well received: residents want to see their much-loved local library reopened and stalemate has prevailed. All that changed when the squatters moved in and embarked on unprecedented negotiations with senior council officials about the future of the library. Read the entire story here: Squatters reopen Friern Barnet library after council closes service. It feels as though this small group has breathed life back into their local library, a hub of the community. How wonderful. 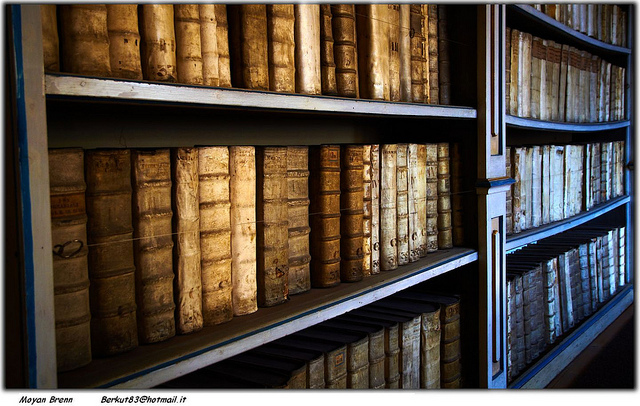 Photo credit: "Old books" by Moyan Brenn under Creative Commons Attribution 2.0.